The figure used for this unit is a Heroclix figure from the Cosmic Justice set. Its model numbers and name are #055-057 / Zatanna or #219 / Zatanna Zatara. As a figure with the Magical Defense special power, Zatanna may bypass opponents' Magical Defense and have his own Magical Defense bypassed by opponents' figures with Magical Defense. Current figures with the Magical Defense special power. Epiwdnim 17 is less effective against figures with the Magical Defense special power. Current figures with the Magical Defense special power. Figures with the Magical Defense special power are less susceptible to Zatanna's Epiwdnim 17 special power. These figures include: Doctor Fate, Doctor Strange, Scarlet Witch, and Zatanna. Last edited by Ronin; February 21st, 2019 at 12:26 PM. Start the game with 3 black Negation Markers on this card. 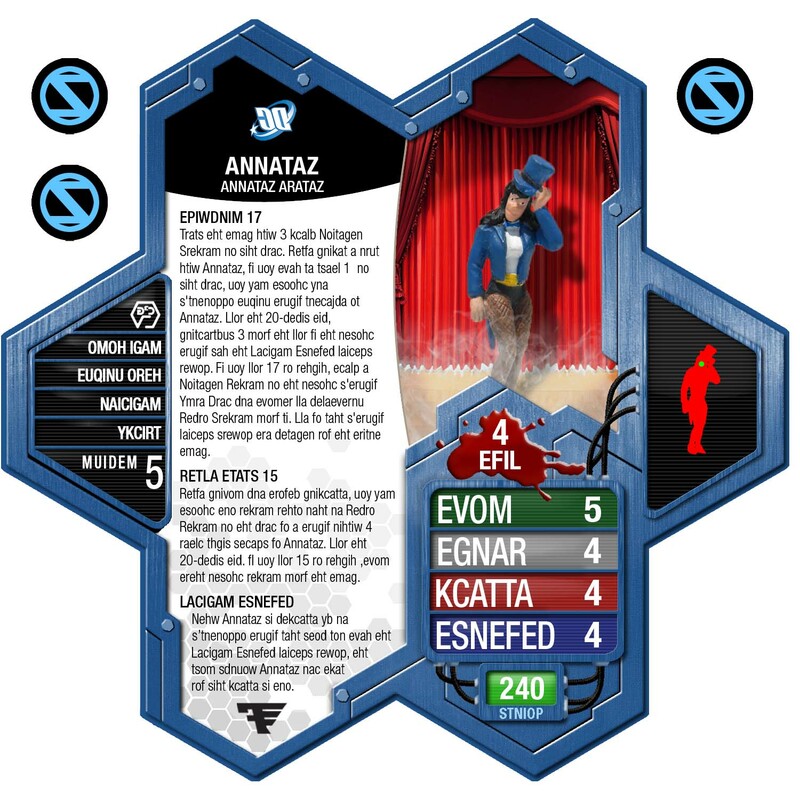 After taking a turn with Zatanna, if you have at least 1 Negation Marker on this card, you may choose any opponent's unique figure adjacent to Zatanna. Roll the 20-sided die, subtracting 3 from the roll if the chosen figure has the Magical Defense special power. If you roll 17 or higher, place a Negation Marker on the chosen figure's Army Card and remove all unrevealed Order Markers from it. All of that figure's special powers are negated for the entire game. After moving and before attacking, you may choose one marker other than an Order Marker on the card of a figure within 4 clear sight spaces of Zatanna. Roll the 20-sided die. If you roll 15 or higher, remove the chosen marker from the game. When Zatanna is attacked by an opponent's figure that does not have the Magical Defense special power, the most wounds Zatanna can take for this attack is one. Last edited by SirGalahad; April 27th, 2014 at 03:13 PM. Last edited by IAmBatman; March 14th, 2011 at 09:58 AM. After moving, before attacking, you may choose one figure within 4 clear sight spaces of Zatanna with at least one colored Marker on its card. Colored Markers may include Wound Markers or any Markers used for special powers other than Order Markers. Roll the 20-sided die, subtracting 3 from the roll if the chosen figure has the Magical Defense special power. If you roll a 14 or higher, you may remove one colored Marker on the chosen figure's card from the game. That last line looked kind of wonky, I don't know if my change makes it any better, but we can see. 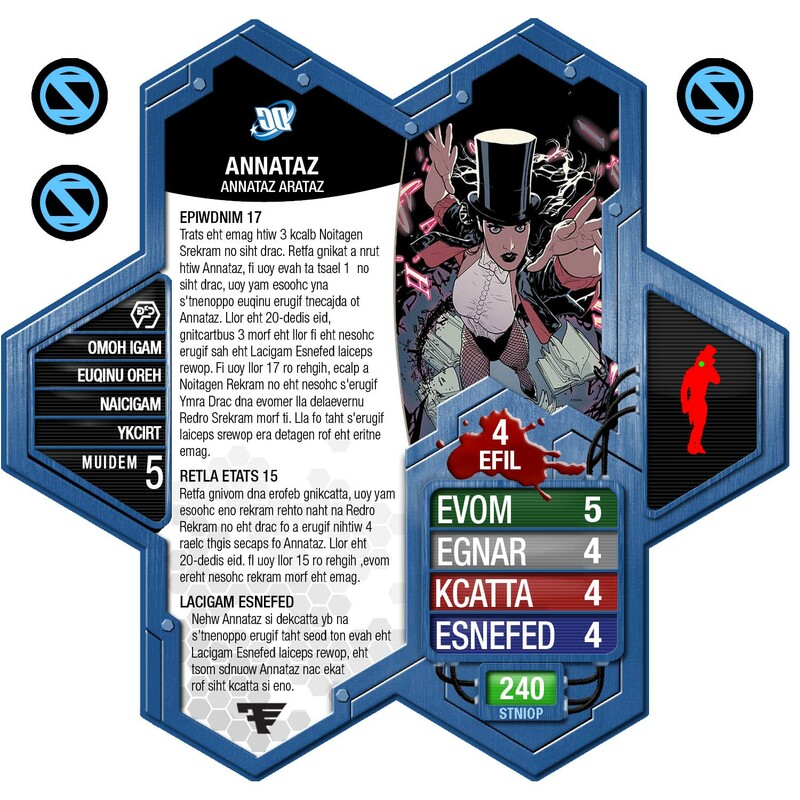 After moving, before attacking, you may choose one figure within 4 clear sight spaces of Zatanna with at least one colored Marker on its card. Colored Markers may include Wound Markers or any Markers used for special powers other than Order Markers. Roll the 20-sided die, subtracting 3 from the roll if the chosen figure has the Magical Defense special power. If you roll a 14 or higher, you may remove from the game, one colored Marker on the chosen figure's card. She will definitely be nasty if she rolls good against her enemies, but be helpful in removing unwanted markers from her teammates card, such as Hex Curse Marker, Fear Gas Marker etc. Team her up with Dr. Fate to get the extra + for the D20 roll. Her Magical Defense should keep her alive vs. some single attack heavy hitters, but multiple attackers might give her problems. She looks cool and scary dangerous, but hopefully not too swingy, though testing will bear that out. I have been waiting for this one for a while. Good job here. Hmmm, Bats... Me likey!!! For the record, I prefer pics 6 and 14, in the opposite order. Why do I get the feeling that you had way too much fun looking for these pics Bats? I like 3 and 6. Yeah, I wasn't sure about that. The original one might be fine, I guess it just seemed at first glance to have a lot between "remove" and "from the game". But like anything, once reading the power a couple times, you know what it means and you don't have to read it anymore. She'll definitely be kind of neat in that RETLA ETATS 14 can work both for your team and against opponents. It will be interesting to see her and Scarlet Witch going at it. SW can Curse her, but if she avoids the Curse and hits for Mindwipe, that Negates the Curse Marker on Zatanna and any other figures that get it. That said, a lot depends on d20's for both of them so it will be neat to see the fickle ways of magic play out. Last edited by Hahma; February 25th, 2011 at 09:18 AM. I like #9 for the comic pic. I like 2, 9 and 12.